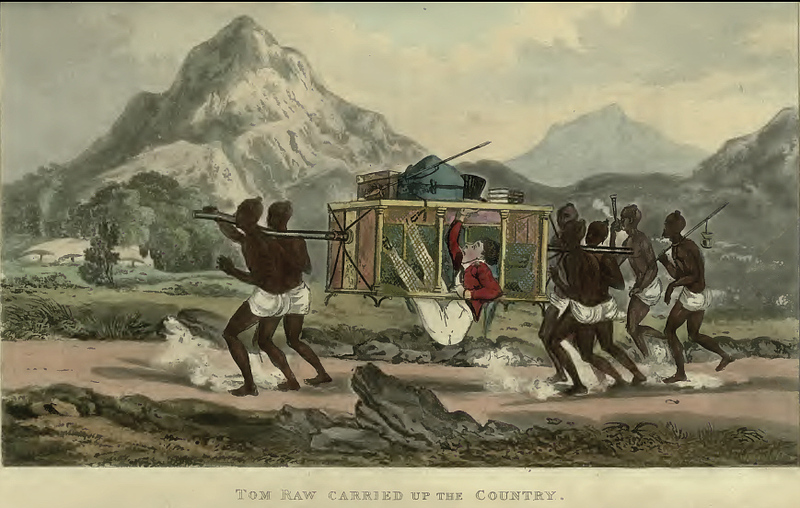 [D’Oyly, Charles <1781-1845>:] Tom Raw, the Griffin: a burlesque poem, in twelve cantos: illustrated by twenty-five engravings, descriptive of the adventures of a cadet in the East India company’s service, from the period of his quitting England to his obtaining a staff situtation in India / by a civilian and an officer on the Bengal establishment. -- London : Printed for R. Ackermann, 1828. -- 325 S. : 25 col. pl. ; 26 cm. -- S. 251 - 278. --Online: http://www.archive.org/details/tomrawgriffinbur00doylrich. -- Zugriff am 2008-06-01. -- "Not in cpyright"
To win fair ladies' hearts, who dare not say them nay. That you have for th' adventurous the same predilection. To learn the bowlings of its wolves.—We claim your pardon. 1 Being much of the opinion of old Horsley. A gentleman long resident in Calcutta, and much esteemed for his literary talents. His aversion to acquire the oriental languages was notorious ; and after spending half a life in India, he could scarcely make himself understood in the common colloquial dialect of the country. And —hocus pocus like — all understandings clears. 2 Humara now. -- My boat. 3 Toom deckho ! -- Do you look. 5 and Kiswasti -- What for. 6 Sub doop gea -- All is sunk. 8 and manjee lou ! -- Bring the manjee. 9 A Chowdry, on whose tympanum it sounded. -- Head inhabitant of a village. 10 'twas that of Thannadar. -- A native officer of police. His employment is to see that peace and order are preserved within a certain range of villages placed under his jurisdiction, to apprehend public offenders, and to make regular reports of his proceedings to the magistrate of the district. 11 And hailed the native police magistrate of Bar. -- A town about thirty miles from the city of Patna. We have selected this place for the scene of our hero's disaster, as it is notoriously famed for accidents. 12 On a chabootra this grave person sat. -- A brick terrace plastered with lime, used by the natives to sit on, and enjoy the fresh air. 13 Lolling cross-legged upon a patna mora, -- A stool. 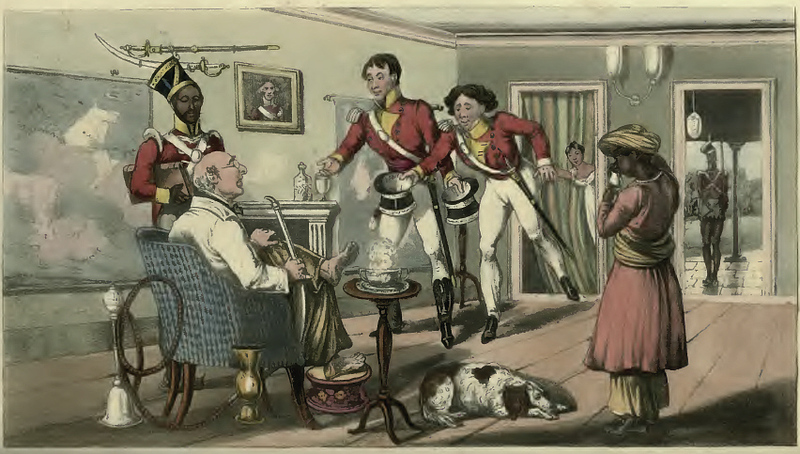 It is of various sizes, so as to admit of being used to sit upon, as well as to support the feet; composed of rattan covered with leather, painted in brilliant colours, representing different subjects, principally hunting scenes. 14 pyjama'd -- Pyjamahs are loose drawers, used in bed, composed of grass cloth or light silk. 15 Banse ke chetai -- A mat made of bamboos. 16 wrapt in a stuffed labador. -- A loose gown. 17 A dozen burkendozes -- Subordinate police officers. 18 stood round the behaudur. -- A title of distinction. 19 A kullean of brass -- A small kind of hookah, differing from those used by the higher class of natives. 20 (His mouthpiece, for convenience had a curve in 't.) -- Called by the natives moonal. It is placed at the extremity of the snake, through which the smoker inhales the fume ; and composed of gold, silver, or a composition called vidry. 21 roaring drunk with toddy. -- The fermented juice of the fruit of the palm-tree, a very intoxicating liquor. "Armed with a little brief authority,"
Rules the poor grists22—as pedagogues their boys. Preferring rods of birch to — patting heads and toys. 22 Rules the poor grists—as pedagogues their boys. -- Labourers of the soil. The native functionaries are usually great tyrants, and misuse the authority with which they are invested. We fear they are for the most part not only tyrannical, but corrupt. And made salaams—as to the landlord does the tenant. 23 Drew out his tulwar, and our hero pinned. -- A native sabre. 24 "Bhote khubherdar" Anglicè, "I am a Company's lieutenant, mind what you're about." Kuptan and lubtenant being ranks generally understood by all who are very apprehensive of provoking the military orders. While, like an abject slave he stood—this man of rule. 25 Provisions called for, and sherbet potations. Sherbet is a favourite beverage among the natives, composed of sugar and water, to which lime-juice is sometimes added. 26 with new-lighted gool. -- The fire ball of a hookah, formed of the charcoal of certain trees and rice starch, and then dried in the sun. A few of these made red-hot, and placed on the opposite side of the piece of earthenware to which the tobacco is attached, lights it, and produces the smoke which is inhaled. Before, were now produced and stowed,—" My stars,"
"And my shako, and history of the wars." His taste, twelve bearers bore him off without dispute. 27 "if there's not my petarrah." -- A round or oval covered box, made of rattan and leather, with a padlock, used to carry clothes, &c. in travelling. Lips, and some brandy pānee28 — oh, how sweet ! When sickness makes the whole day's meager meal retreat. 28 some brandy panee. -- Brandy and water. For journeying without such bodily affliction. While sun and rain, in turns, were broiling him and baking. 29 Gyah was past in safety. [Gaya] One of the most sacred cities of the Hindoos, to which pilgrimages are made from all parts of India. The Government derive a revenue from a tax on pilgrims ; and to superintend the collection, a gentleman (not in the Company's service) is paid a large monthly salary. 30 A glimpse of her far-famous Bishenpud. -- A magnificent black stone temple at Gyah, to which the pilgrims repair to perform their religious ceremonies. The sculpture of the walls and pillars, and of some of the idols, is ably done. 31 Sheergotty was in sight. -- A station about thirty miles from Gyah, on the Company's new military road. And down he dropped — stern foremost—filled with fears. Which he— without the slightest ceremony— curst. Where might they end, if he o'ercame the present? And found a village near which favoured his retreat. A most strange looking carriage to the sight. But goes, as if the vehicle had wings. With galloping tattoo, and —harness made of strings. Was sent to Bar —which place it never reached perhaps. But to a different tune his voice was forced to screw. 32 Crack went the chabuck. -- Whip. 33 "Chull ! bheeta chull !" -- Move on, my son, move on. Bheeta, or son, is applied by the natives to animals. 34 Baroon's sandy shores. -- A village on the banks of the river Soane, which intercepts the Company's road at this spot. The bed of the river in the dry season in breadth is calculated t five miles. 35 The Soane is ferried. -- A fine clear river, which has its source at Sohagepore, and disembogues itself into the Ganges at Moneah, about ten miles from the military cantonment of Dinapore. Moneah is celebrated for a beautifully sculptured mausoleum and tank. The water of the Soane is as clear as crystal in the dry season, and the pebbles over which it runs bear a beautiful polish, and are much esteemed for the variety and delicacy of the fragments of petrified vegetation found in them. 36 And then through Saassuram they gallop fast. -- An ancient town, celebrated for the insulated mausoleum erected to Sheer Shah, which covers the little finger of that sovereign, having been the only part of him found on the field of battle, in which he perished, and distinguished only by the royal signet. There are the remains of another mausoleum, begun by Sheer Shah to his father, which is also placed in the centre of a large deep pond. Through all the stages of his mad career ? He once more took to dawking37 up the Company's road. 37 He once more took to dawking up the Company's road. -- Travelling post in a palankeen. To introduce old Colonel Kyan, —Commandant. 38 We find it at Benares. -- A sacred Hindoo city, in which is the finely sculptured temple of Vishvesar, of which there are plates, from drawings made by the late chief engineer Colonel Garstin. Benares is also remarkable for two very elevated minarets. At Secrole, about five miles from the city, there is a large civil station, and cantonments for two or three battalions of native troops. 39 as he'd hash up a fierce Goorka. -- The Goorkas are usurpers of the Napaul country. The aborigines are styled Nawars. He cared not a rupee — "The devil's in 't,"
" 'Tis all the same to me—or foul or fair ;"
Most people styled him —Ursus Major—the Great Bear. Though he would soon knock down the advent'rous wight that said it. Of water did he know the cleansing power. Was living with him. —Many, too, had sought her. And we'd not, willingly, get into the wrong box. 40 She'd never been " at home" -- "At home," in India, is generally understood to mean "in England." 41 At Mrs. B—ks the damsel had been placed. -- One of the many respectable governesses of schools for the education of girls born in India. 42 With many a lash and chucker from Dame B. -- Chucker is literally a wheel, but, as here used, applies to breaking-in young horses, gallopping or trotting them in a ring or circle. Peeping, most lovingly, into her father's bank. 43 Tired with the diccut of his household duty. -- A Persian word signifying trouble. To youthful preferences — so let the matter rest. While she delights to renovate her arts. And watch the various pangs her fatal eye imparts. His head, large brimming kedgeree44 pots by the score. 44 large brimming kedgeree pots by the score. -- Large earthen water pots, used for bathing. We know not why they are called kedgeree pots, except that Kedgeree is the place where they are usually manufactured in the vicinity of Calcutta. And when preliminaries of "How d' ye do,"
Were over —bids them take a chair.—The men brought two. Drinks bowls of chicken-broth, and then betakes to smoking. That seemed to threaten gout —it burnt like flame. And murmured out a curse — "Well, Mr. Gra'am,"
His mouth enormous, —"prithee, what's his name?" "He has been wrecked, I trow, and what not a' beside." "Charlotte ! come in — My daughter, Charlotte Kyan !
" 'Tis time to take it —Mr. Raw, you've not been ill ?" And he expressed surprise.— " Oh ! dinna' fear,"
"That siller, says the proverb, makes the mill to turn." Set of fine fellows, on the world old stagers. To mix in any sport or frolic prompt engagers. And not a headach in a hogshead — Well ? What more? —- why that beneath the board some topers fell. 45 Pledged lumba peallas offresh carbonell. -- Anglicè, long wine glasses. Into her room, then, quickly retrograding. She stole away, and soon her downy bed was laid in. Much consolation that on him death had not frowned. Flattering themselves, with many a jocund laugh. They'd got a step, and were —too fortunate by half. Infirmities, to see how soon they'd be a major. Of seniors' constitutions— silly ones ! Of rising o'er their peers— themselves left in the lurch. It is not callousness of feeling !—no ! The tapers of men's lives that brings the thing about. Puffing and blowing with the strenuous turmoil. And, at their tittering, felt his cheeks, like hot coals burning. The energetic penetration of his gaze. That she dreamt also of the youth when sleeping. They gave a squeeze — Oh, force of sympathies ! And then they seemed so very much delighted. As if they, tacitly, their vows together plighted. Into the bowers of my lady fair. We'd give you the first stanza of it, did we dare.